Central Intelligence Agency (CIA) reports about Amateur Radio in the former Soviet Union (including the Baltic States) and Warsaw Pact member countries have been declassified to a new searchable online database, the CIA Freedom of Information Act (FOIA) Electronic Reading Room. Documents include translations and assessments of Amateur Radio clubs, including Soviet DOSAAF (Volunteer Society for Cooperation with the Army, Aviation, and Fleet) groups; training; monitoring Sputniks; technology and equipment, and even QSL cards. Radio amateurs in the US and in Scotland have reenacted the first successful transatlantic reception of a shortwave Amateur Radio signal nearly a century earlier. Special event station N1BCG in Greenwich, Connecticut, and GB2ZE in Ardrossan, Scotland, completed contacts on SSB and on CW during the December 11 event. ARRL, the Radio Society of Great Britain (RSGB), and the Radio Club of America (RCA) partnered to support the activity, organized by ARRL CEO Tom Gallagher, NY2RF, and Clark Burgard, N1BCG, who loaned his history-rich call sign for the occasion. On December 11, 1921, in Ardrossan, Scotland, reception of a radio signal transmitted from an RCA test station — located in a small shack on the Greenwich, Connecticut, property of Minton Cronkhite, 1BCG — helped to usher in the age of global communication. In Scotland, American Paul Godley, 2ZE, clearly heard the signal using a receiver of his own design. Following the resumption of Amateur Radio activities after World War I ensued a thundering herd of advances in the state of the Amateur Radio art. Here are some highlights from that period. April 1922 — The first contact was made between California and Hawaii. September 1922 — 1CCZ worked every US call district in one night, the first time that had ever been accomplished. November 1922 — Another record-breaking relay was accomplished, from 1AW to 9AWM to Hawaiian 6ZAC and back to 1AW in 4 minutes 18 seconds. June 1923 — The first expedition using Amateur Radio sailed. The schooner Bowdoin (WNP) had Don Mix, 1TS, aboard as its operator. This and later Bowdoin expeditions were searching for the land mass that was thought to exist at the North Pole. September 1923 — VK2CM contacted ZL4AA (a 1500 mile path), with VK2CM running 4 milliwatts on CW! November 1923 — 1MO and 1XAM worked F8AB, the first transatlantic contact. December 1923 — 1EH made contacts with England, Italy, and Holland. May 1924 — The first contact was made between New Zealand and Argentina, a new DX record of 6400 miles. The same month saw the first contact between North and South America. July 1924 — All previous shortwave work had required “experimental” licenses. After considerable groundwork by the ARRL, the government allowed shortwave work by all amateurs, with band assignments of 1.5 to 2.0, 3.5 to 4.0, 7.0 to 8.0, 14.0 to 16.0, and 56.0 to 64.0 MHz. September 1924 — The first confirmed contact was made between California and New Zealand. December 1924 — The first daylight transcontinental signals were heard, from Connecticut to California, as John Reinartz, 1QP, made experimental transmissions on the new 20 meter band. April 1925 — The first published article on the theory of shortwave propagation appeared in QST, authored by John Reinartz, 1QP. Also in April, the International Amateur Radio Union was formed at a conference in Paris, and Hiram Percy Maxim was elected as its first president. May 1925 — The first contact was made between Australia and England, during daylight hours on 20 meters. April 1926 — The Worked All Continents award was first offered; it garnered eight initial members. May 1927 — The first annual ARRL DX Contest was held. March 1928 — The 10 meter band was opened to Amateur Radio use. These were just a few highlights from that wonderful era of advancement of the radio art by amateurs. Next week: On to the 1930s. Daylight Savings Time. Most of us in the U.S., save for Arizona and Hawaii, have been practicing this semi-annual time change for as long as we can remember. More summer light and theoretically less power consumption. But is it really so great? 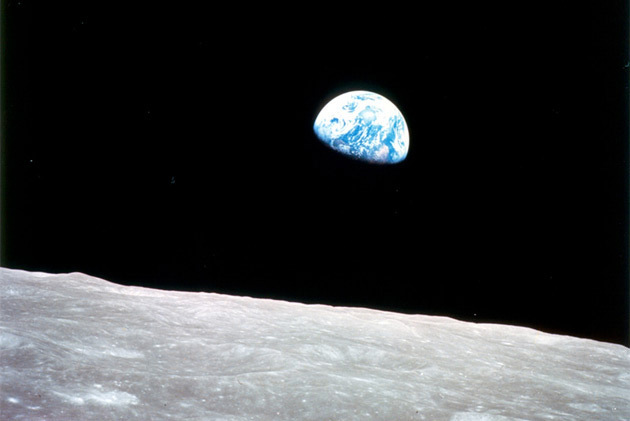 1968: The crew of Apollo 8 delivers a live, televised Christmas Eve broadcast after becoming the first humans to orbit another space body. Frank Borman, Jim Lovell and William Anders made their now-celebrated broadcast after entering lunar orbit on Christmas Eve, which might help explain the heavy religious content of the message. After announcing the arrival of lunar sunrise, each astronaut read from the Book of Genesis. How this went down at the Baikonur Cosmodrome in the Soviet Union is unknown, but it stands in stark contrast to the alleged message sent back to Earth several years earlier by cosmonaut Yuri Gagarin, the first man in space. People on Earth may take for granted today’s high-tech world of cell phones, GPS and the satellites high above the planet that make instantaneous communication possible. But it all began 50 years ago with one giant space balloon. Echo 1, the world’s first communications satellite capable of relaying signals to other points on Earth, soared 1,000 miles (1,609 km) above the planet after its Aug. 12, 1960 launch, yet relied on humanity’s oldest flight technology — ballooning. CEDAR RAPIDS – An unheralded group of Vietnam War-era Army signals intelligence officers took a step into the daylight Friday to donate one of their favorite radios back to its manufacturer. The 265th Radio Research Company used many radios in their service in Vietnam from 1967 to 1972, but the R-390A HF (high-frequency) receiver they donated to the Rockwell Collins museum was something special, they said. “This has been a workhorse,” said Doug Bonnot of Jonesboro, Tenn., the president of the Radio Research Company Veteran Group . This week, the League celebrates the 140th anniversary of the birth of ARRL’s co-founder and first President, Hiram Percy Maxim, W1AW! Maxim — born September 2, 1869 — decided a national organization for Amateur Radio was in order after he needed a “relay” station in Agawam, Massachusetts to pass a message he was sending from Hartford to Springfield, Massachusetts. In honor of The Old Man’s (TOM) birthday, the ARRL is holding a week-long Special Event, where eligible amateurs may add /140 to their call signs. A complete list of who may add /140 can be found on page 20 of the September 2009 issue of QST. Hams who work at least 25 /140 stations can earn an attractive certificate; this certificate can be endorsed in increments of 25 QSOs, up to 100.